$5 concert at Chicago Bridgehouse Museum. Friends of the Chicago River’s McCormick Bridgehouse & Chicago River Museum is excited to partner with the Old Town School of Folk Music and participate in their summer concert series, 77 Beats. When: Thursday, September 22, 2016 5:30 p.m. – 7:30 p.m..
Where: McCormick Bridge House & Chicago River Museum, 376 N. Michigan Avenue/99 E. Riverwalk, (312) 977-0227. Tickets are $5/adult, $4/child, includes a visit to the museum. CLICK HERE to purchase tickets. The event is BYOB, so bring your own bottle of refreshment. Chicago legend Harmonica Hinds and his trio will perform on the museum’s outdoor plaza. Hinds has performed in the Chicago land area since the early 1970’s. He performed in the house band at Theresa’s Lounge. Other members of the band included Junior Wells, Sammy Lawhorn, John Primer, Earnest Johnson, Nate Applewhite and Muddy Waters Jr.
77 Beats is a musical travelogue designed to celebrate all 77 of Chicago’s ethnically-diverse neighborhoods. 77 Beats presents a series of performances representing the music and culture of each neighborhood, paired with other cultural elements such as cuisine, visual arts and traditions in unique and unexpected locations. Enjoy legendary blues musician, Harmonica Hinds, along the Chicago River. Eating and drinking along the Chicago River. Friends of the Chicago River opened the seasonal landmark five-story McCormick Bridgehouse & Chicago River Museum in 2006 to provide new access and understanding of the dynamic relationship between Chicago and its river. Today, the Bridgehouse Museum stands as the cultural anchor of the new Chicago Riverwalk and welcomes tens of thousands of visitors every summer. Exhibits celebrate Chicago’s river and world-famous movable bridges, and visitors learn why it is important to protect the river and how to participate in its renaissance. On bridge lift days every spring and fall, the museum’s gear room give visitors a behind-the-scenes look at the moving gears as they lift the massive Michigan Avenue bridge leaf, allowing boat traffic to pass through a spectacular, deeply authentic Chicago event. 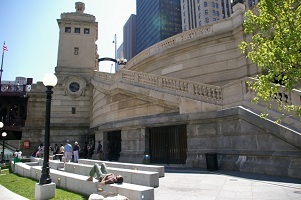 COTC note: COTC remembers when bridge tenders were stationed in the southeast Michigan Avenue bridgehouse. Sometimes they would be hanging out at the window and would wave at passersby. The bridges were manned 24/7 with three shifts of operators. These were much maligned cushy city patronage jobs. How many bridges go up at 2AM?. The last permanent bridge tender along the Chicago River was at the Kinzie Bridge in 1999. There are still a few tended bridges on the Calumet River.